The FSW-420 & FSW-430 Series have been discontinued. Please see the FSW6000 & FSW7000 as a possible alternative or contact our Flow Engineering department. 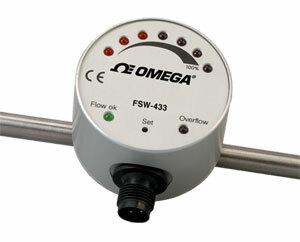 The FSW-420/30 Series monitors your relative flow rate for applications where the actual flow rate is not important. The FSW-420/30 series is easy to install and use. Just put it into the pipe and it’s ready to go. The FSW-420/30 series sets your present flow-rate at 100% at power up. Relative flow rate is indicated by the 7 LED lights. When the flow rate drops to 50%, an alarm goes off. If you prefer, you can adjust the alarm point to fit your needs. A green output indicating LED is also included. 참고: Comes complete with operator's manual and pre-wired 2m(6/5') cable. Standard valves are Normally Open. For optional Normally Closed valves, add "-NC" to model number, no additional charge.